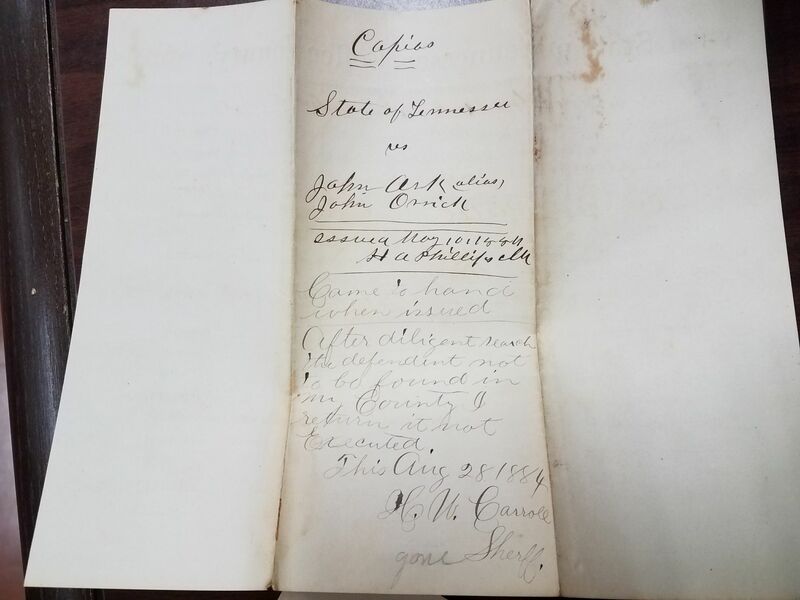 Researcher Lori found this court document for John Riley Arrick in the Coffee Co TN Archives. Thank you LORI! 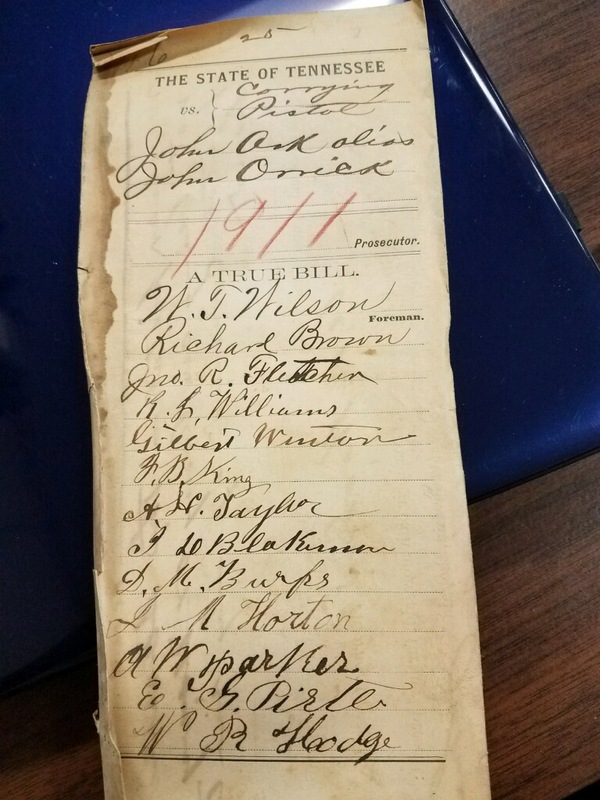 The document is mismarked 1911 - it's really 1883/1884. 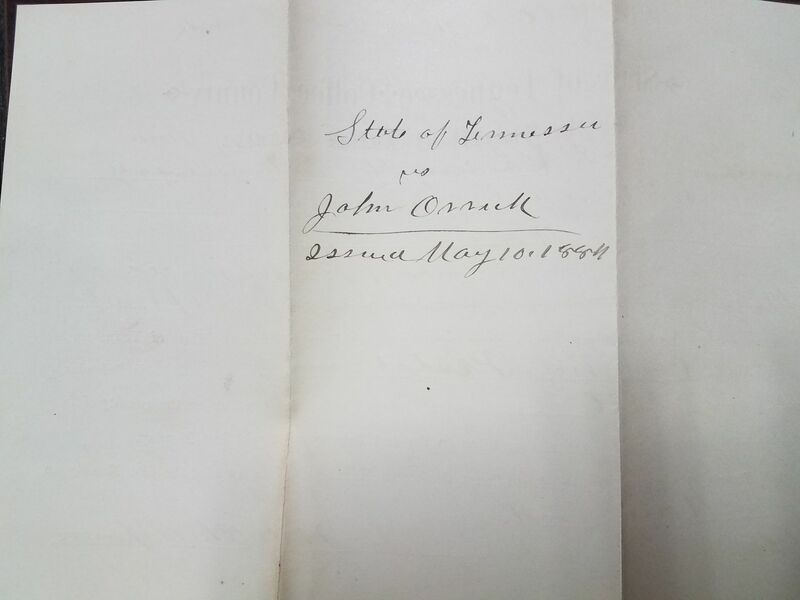 It refers to him as 'John Ark' which matches everything we know about how the name was pronounced, and it certifies his real name was John Orrick which is known by connecting the dots but not found in any other document we've seen. In the 1900 census he is listed as ARRICK and all of his kids and wife used that name. The accusation is he was seen carrying a pistol on 1 Oct 1883. 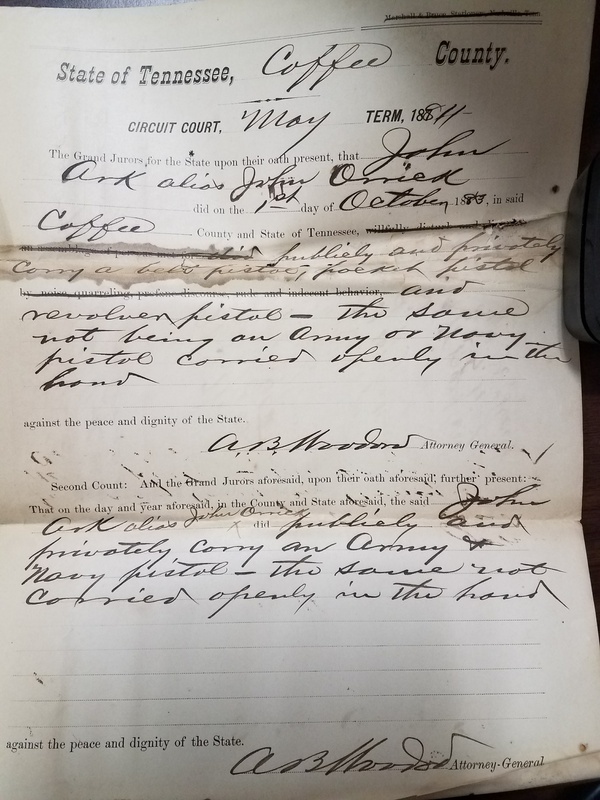 Set for court date for Sept 1884, then declared unfound May 1884. John Riley Arrick was married to Minerva Viola Harrison 27 Nov 1884 in Hardin Co, TN and shortly after that moved the family to Kaufman Co Texas where they lived until 1906 using the Arrick name. He wasn't faking his name at that point because his mother Margaret used it in the 1880 census and his brother James used Arrick. We've never known why John took his wife to Kaufman co, so this might be at least part of the reason. We know others from TN were in the Kaufman area too. It might also explain stories we've heard about the Harrison family believing John was unworthy of marrying Minerva. Here's John Riley Arrick's research page. State of Tennessee vs John Orrick. 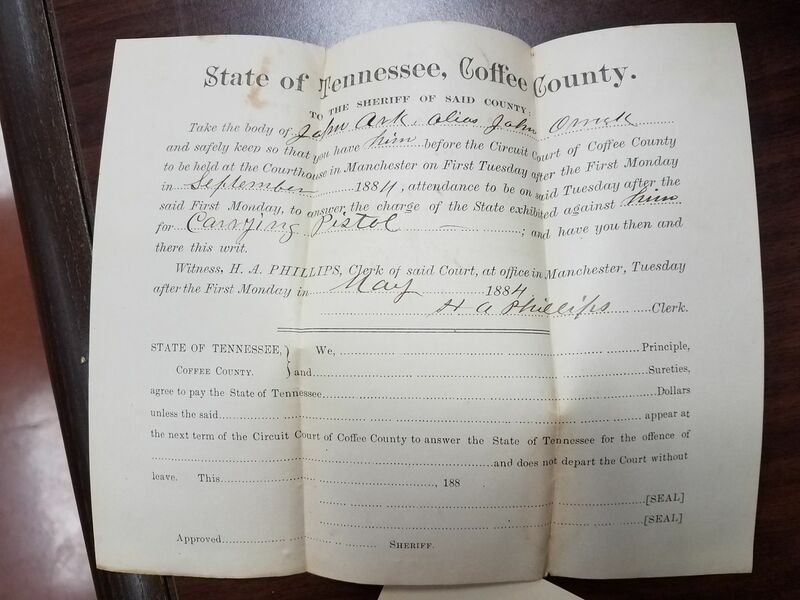 State of Tennessee, Coffee County Circuit Court May 1884.
carry an Army + Navy pistol - the same not carried openly in the hand. To the sheriff of said caount, take the body of John Ark alias John Orrick and safely keep so that you have him before the Circuit Court of Coffee Co to be held at Courthouse in Manchester on First Tuesday after the First Monday in September 1884, attendance to be on said Tuesday after the said First Monday, to answer the charge against him for carrying pistol bla bla bla. 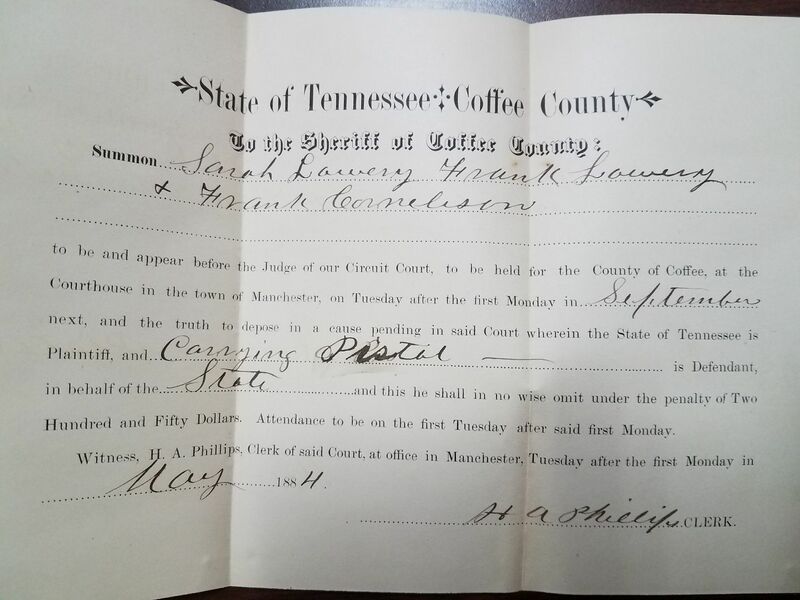 Summon Sarah Lowery Frank Lowery + Frank Cornelison to be and appear before the judge bla bla bla September next to depose in a case pending in said Court bla bla bla May 1884. After diligent search the defendant not to be found in my county. I return it not executed.